Deaf Reach Schools and Training Centers, a project of Family Educational Services Foundation (www.fesf.org.pk) offer academic and vocational skills training for deaf children and young adults in an enabling environment where students can excel. In addition to a full academic regimen, they also learn marketable skills such as Culinary Arts, Tailoring, Stitching, Embroidery, Arts and Crafts, IT, Carpentry, and more. Six Deaf Reach Schools and Training Centers care for upwards of 800 deaf students and are located in Karachi, Hyderabad, Sukkur, Nawabshah and Lahore. A new donated campus - under construction in Rashidabad, Tando Allahyar - will soon accommodate 500 children. In Pakistan, Deaf Reach is the only branch network of schools reaching out into rural areas for special needs children. Statistically, there are over 1.5 million deaf children of school going age in Pakistan and less than 2% have access to education. Education and skills training is provided on a pay-as-you-can-afford basis, with 98% of students on full scholarships. Facilities cover all academic and vocational costs, inclusive of free pick and drop transport, healthy snacks or lunch, books and stationery, uniforms and excursions. Literacy training for parents, families and the community is also emphasized, enabling them to communicate with their deaf children. This holistic, community centered approach is an educational model to meet the increasing need for Deaf Education in Pakistan, and is replicable in all areas of the country. At first sight, children at the Deaf Reach School (DRS) in Gulistan-e-Jauhar, Karachi are like any other school going children. They enjoy playing cricket, are excited to receive visitors and love going to computer class. The difference is that all of these children are deaf, and many are attending school for the first time. Apart from the most rudimentary sign language, the students at DRS have not had an access to a medium that allows them to communicate with the rest of the world. The school, along with teaching English, Mathematics and Science, coaches these children and their parents in sign language. DRS, a project of Family Educational Services Foundation (FESF) recently received 10 Young Explorer units through IBM’s (NYSE:IBM) KidSmart Programme – a worldwide initiative that uses technology to more effectively introduce children in early-year settings to essential skills and knowledge. As an added benefit, it enables children to become more comfortable with technology. 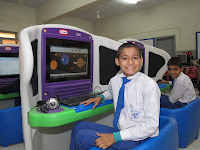 The Young Explorer(YE) is a computer housed in brightly-colored, child friendly Little Tikes furniture, equipped with award-winning educational software to help children learn and explore concepts in maths, science and language. The YE units are specially designed for children aged three to five with a focus on creating a positive impact on preschool learning and teacher training in line with government education agendas. Technology already plays an important part in delivering lessons at DRS. Multimedia used during class speeds up the learning process together with making the curriculum more fun and interactive. IBM’s KidSmart programme will augment DRS’s ICT setup helping children learn important socialization skills, preparing them for future success in school and help level the playing field while ensuring all children have access to educational tools. Students at DRS have started using the Young Explorer units collaborating with teachers where the software provides verbal instructions or comments. 'At Deaf Reach Schools, technology is a key component to enhance learning. The KidSmart program has had a significant impact in our students' lives, providing easy to use IT access and visual input allowing them to fully participate in learning activities. Students wait in anticipation for their sessions to start on the individual KidSmart stations, and they fully engage in creating graphic design art work, learning math, and developing improved computing skills.' Richard Geary, Executive Director, FESF. ‘Today, with rapidly changing technology, unlimited internet access and dynamic educational resources, there are many options to provide education for students with special needs. 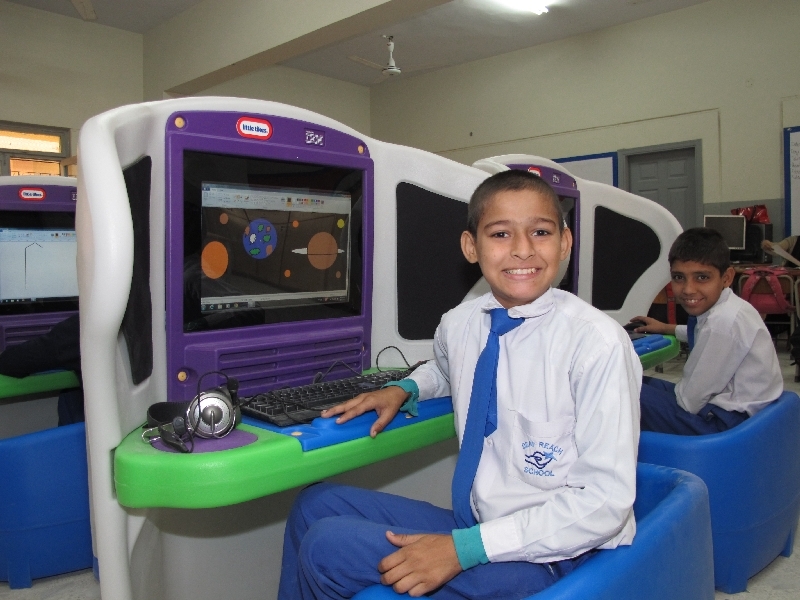 Embedding modern technology in curriculums, like the KidSmart programme, provides tremendous opportunities for education, offering hope for a better future.’ Adnan Siddiqui, Country General Manager, IBM Pakistan and Afghanistan.